We’re sick and tired of seeing extremely talented yoga teachers burning themselves out trying to make a living. What other industry out there has experts working 60hrs/week and just barely paying the bills? The fact of the matter is: after a yoga studio pays rent, heating/cooling bills, teacher wages, etc… there just isn’t enough leftover to pay teachers a livable wage! The economics just don’t allow it. Are you saying yoga teachers should ditch the studio all together? But understand… it’s nearly impossible to earn a sustainable living by ONLY teaching at yoga studios. Instead, use yoga studios as a place to hone your skills, build a following, and test out ideas. 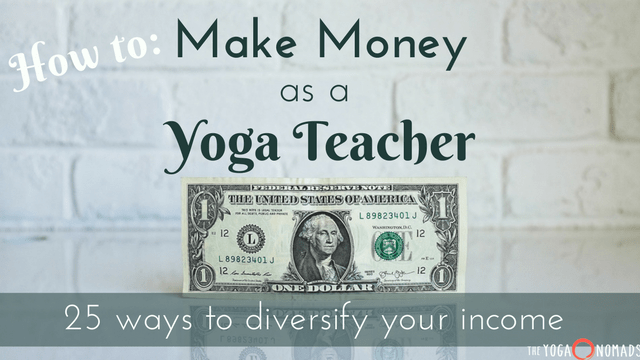 Luckily, diversifying your income (#3) IS possible for most yoga teachers! And this is the topic we’re discussing today. How much money do yoga instructors make? This is a really common question and yet challenging to answer. CNN claims the median income for yoga/pilates teachers is $62,400 USD per year. Sorry CNN but that is simply not true, the real answer is closer to HALF of your estimate. 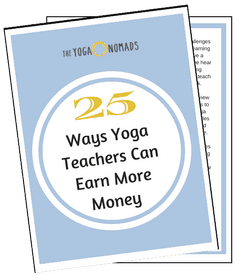 The income ranges tremendously from the top to bottom of yoga teachers. While most teachers earn less than $30k USD per year, some teachers earn $300,000 or more. The teachers who earn the most all have one thing in common… they earn most of their income OUTSIDE the studio. In other words, they get paid from some combination of workshops, trainings, online sponsorships, and more. 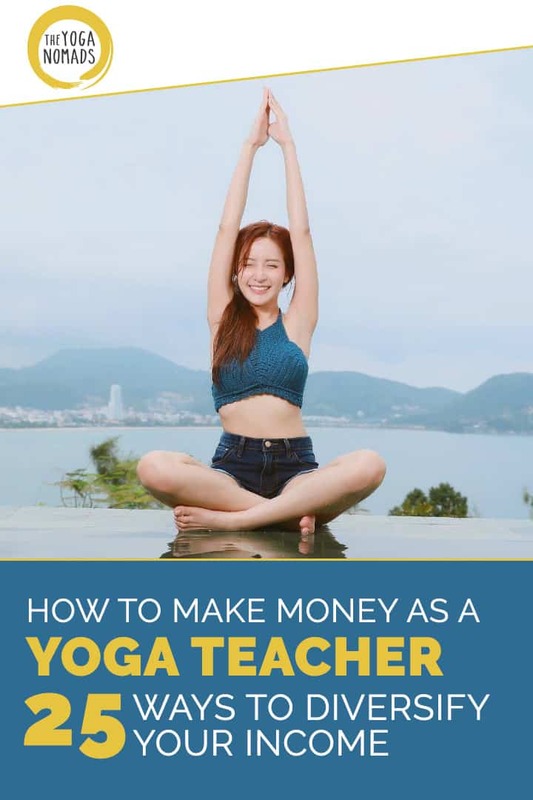 Alright lets dive into how to make money as a yoga teacher. We broke these income opportunities into three categories to help you focus on what makes the most sense for your unique situation. Yoga teachers who build robust businesses almost always have multiple streams of income. Keep that in mind as you’re considering your next move. Always seek to diversify your yoga teacher income. As always, take what works and leave the rest. 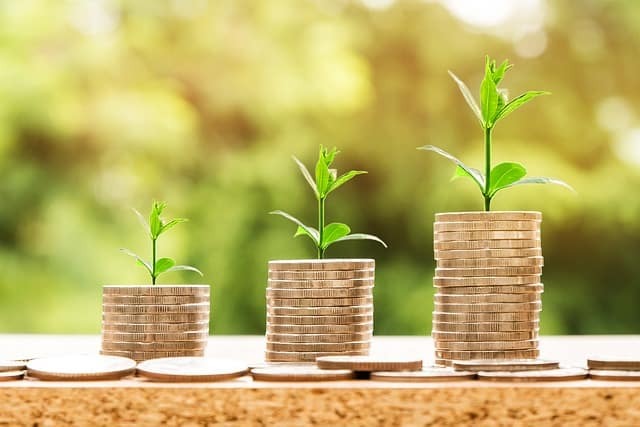 These income opportunities are perfect for newer teachers and anyone who is just getting started diversifying their income. Most of these are low risk and you can get started right away! Prerequisites: 200hr YTT certification + a burning desire to build a sustainable future as a yoga teacher. Some universities will hire yoga teachers to offer classes to their students. Usually the school will pick up the tab making the classes free for students! Try contacting the “Student Services” or “Rec Center” to inquire about job opportunities. Don’t forget Community Colleges and Community Centers! They are often looking for yoga teachers to add to their class schedule. It’s becoming quite common for companies to offer yoga as a perk to their employees. Ask your local network to find out which companies would be interested. Most successful teachers in this space charge a flat $X/class (no matter how many people show up). Anne does this in Minneapolis. Yep, it’s true. Many well known online publications don’t pay much (or at all). However, some do and if you like writing, it can be a great way to make extra money while networking with the yoga industry. Bonus points if you already have your own website. Each freelance article you write includes a “backlink” which means your articles will include links back to your personal website. These “backlinks” have SEO benefits and will send traffic to your site. Launching a full on yoga studio is hard work and wildly expensive. A popup studio is a great way to create the community feel of a studio without the upfront investment. Or try renting out your favorite local event space to offer a unique experience! Do you enjoy working 1×1? Private yoga lessons are a great way to increase your income while helping your students change their life. Privates require a bigger time investment than group classes. Keep pricing structure simple and don’t undercharge! Privates typically range from $60 to $200/hour… we never recommend less than $80/hour. Some even offer private yoga via Skype! Podcasting is like blogging: it’s a great way to build an audience but takes a long time to earn big money. Luckily, it’s easy to get started: you just need a microphone and an interesting theme to talk about. 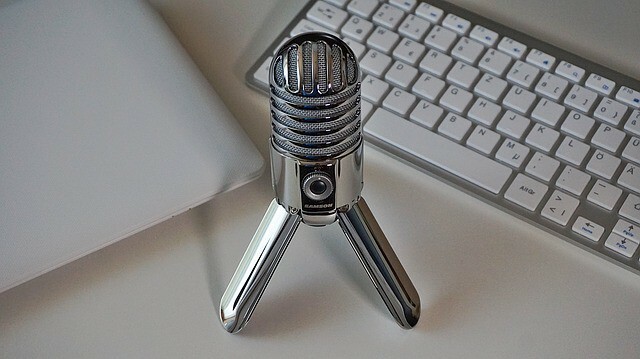 Besides building traffic to your website, podcasts can earn you money by selling sponsored ads at the beginning of your episode. Our friend Amanda Kingsmith created a podcast called M.B.Om which is all about helping yoga teachers build their business. I encourage you to to check it out! If you want to listen to our episode on M.B.Om, here’s the link. The perfect job for the tech savvy entrepreneurs among us. 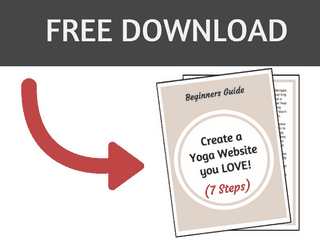 Most yoga studios are understaffed and need help with their marketing. Consider offering your skills as a part-time expert. You could make a great living REMOTELY by freelancing with 3-5 yoga studios. As you provide a larger impact, you can increase your prices. Useful skills include: Website development/design, email marketing, social media marketing, etc. These are your “bread and butter” as a yoga entrepreneur. Carefully executing one of these ideas has the potential to dramatically increase your income and change your life in the process. Don’t rush into these opportunities, they require strategic business strategy and long-term planning. 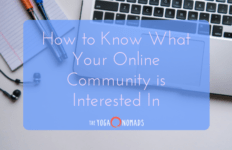 Prerequisites: You have identified your niche, manage a growing website + email list, and you’re making some money from your yoga business. At least 1-year of teaching experience. The online course industry is over $100B annually – now is the time to explore it. Consider turning your knowledge/skills into an online course. There are endless opportunities in the yoga space: Intro to yoga, how to successfully launch a yoga retreat, how to create a yoga sequence, etc. 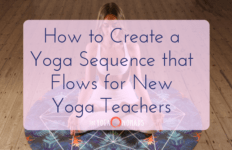 If anyone wants a million dollar idea: Create a “YTT course” without the ‘teaching yoga’ part – perfect for people who want to learn and deepen their own practice (but don’t want to teach). 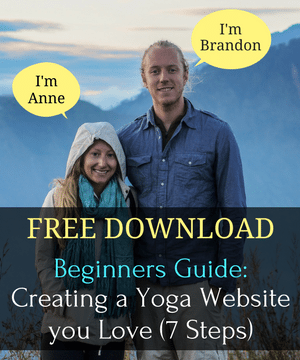 Anne and I earn a significant portion of our income from our online course, CreateBeautifulYogaWebsites. 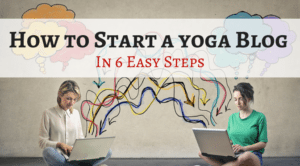 We walk yoga teachers through the process of creating their very own website and teach the basic online marketing skills (social media, email marketing, blogging, etc). 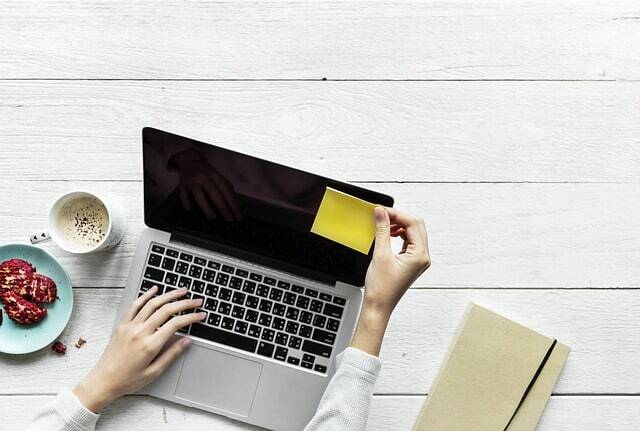 If creating a website and building a brand online is something you might be interested in, click here to join our waitlist. We’ll alert you the next time the program is open. Unless you have a thriving community and a decent sized email list, I wouldn’t pursue this option. Many “big time” yoga teachers struggle to make money with retreats and just end up getting a free working vacation. No matter what you do, plan it super far in advance. Partner up with another yoga teacher if it’s your first international retreat. A perfect opportunity for the first time yoga retreat organizer! Less planning, less risk, and potentially more profitable! 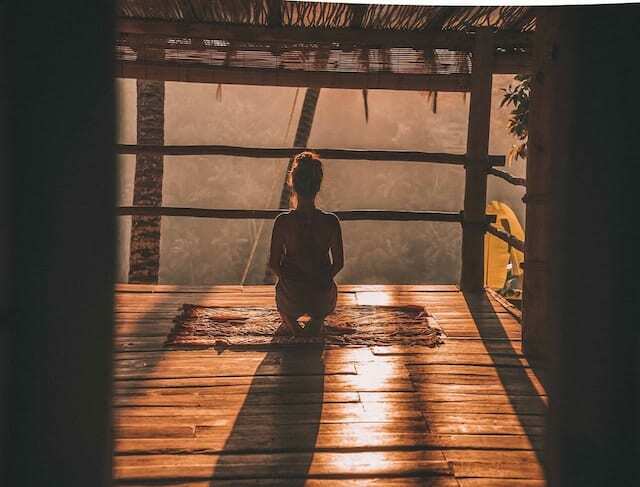 Many of your students want to go deeper into their yoga practice but don’t have the time/money for a retreat in Costa Rica. Create an attractive offer within 3 hours driving distance from your city. Get creative with the location: ski lodge, in nature, on a lake/river, etc. What goes well with yoga? We’ve seen tons of great hybrid retreats, such as: travel+yoga, scuba diving+yoga, hiking+yoga, surfing+yoga, etc. Hybrid/combo retreats appeal to people who have many diverse interests. Cough, cough, I fit into the “have many diverse interests” category… oftentimes to a fault. Develop a unique 2-3 hour workshop to deliver at yoga studios. 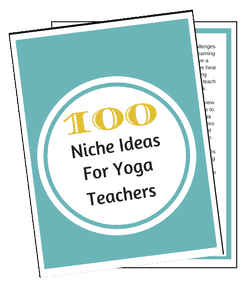 Consider your expertise and what yoga students are looking to learn about. Going very specific/niche is a good way to increase the price of your workshop. Do you like traveling? Pitch your workshop to studios while on the road! Want to reach more people? Record your workshop and sell it through your website! One of our clients Jen Stuart offers workshops on recovering from trauma with yoga. Employees are starting to wake up and demand corporate wellness programs from their employers. You can make big changes in an organization while earning a steady income! You can both teach classes to the staff of a company while managing the corporate wellness offerings (spin, yoga, meditation rooms, nutrition planning, etc). Have you noticed a need that is not being fulfilled in the yoga niche? Or maybe you’re very talented at making jewelry? Either way, creating a physical product is potentially a lucrative endeavor. We’ve seen clothing, yoga props, jewelry, and many more become successful. You can test out how popular your product is on Etsy before investing in your own website. Our friend Jessica created a yoga many company called YOGO. They sell the best traveling yoga mat on the market; we love this thing. Do you like being on camera? Maybe it’s time to record a few classes or a guided meditation. You can offer these classes through your website! Protip: give away a free class in exchange for signing up for your email list! Email lists are the most effective way to build long distance relationships with your readers and eventually sell your service/product. Are you super organized and like working with people? Consider managing your favorite studio! Not only will you increase your total income and have more steady hours, but you will also understand the inner workings of owning a studio. What about owning a yoga studio? Sadly this is a very challenging business to run. The economics of yoga studios aren’t very attractive. In other words they are a lot of work and aren’t very profitable. No surprise why studios can’t pay their teachers very much. Over 15,000+ people become certified to teach yoga each year in the US alone and that number is only growing by the day! Remember when you first started teaching? Imagine how helpful a mentor would have been! You could work 1×1 with yoga teachers or even create an online course that continues the learning from YTT programs. It’s no secret that many people like music with their yoga. Consider creating an experience that incorporates live music with yoga and performing at festivals and other events. Claire Thompson created Yoga of Bass allowing her to perform at conscious festivals all around the globe. We attended her yoga class while being bathed in bass music at Oregon Eclipse Festival in 2017. 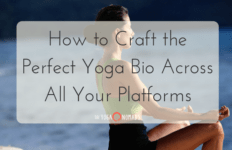 Once your online following starts to grow, consider partnering with yoga/niche brands. They will pay you for mentioning them on your website/social media. Remember: Avoid partnering with brands you don’t support – it will hurt your credibility! These are the flagship products. They require years of experience, months of planning, and plenty of hard work. Successfully implementing any of these opportunities has the potential to increase your income (and positive impact in the world) to previously unimagined levels. Most yoga entrepreneurs say that tremendous personal growth was required to make it to this stage. Prerequisites: You’re making a decent living from your business + have a thriving online community that you understand deeply. You’ve been teaching or running your business for at least 3 years. Do you have your own unique style of yoga? Or maybe your own creative/artistic style? Consider creating a certification program and teaching others your style! Certifications can range from a full on program down to a laser focused weekend intensive. Many programs count towards the Yoga Alliance continuing education credits. Our dear friend Sofiah Thom is offering a Temple Body Arts certification program coming up in June of 2018 in Costa Rica. The program is a tantric path to reclaiming your feminine power. Are you super organized and enjoy facilitating events? Considering creating a niche online community (like a forum) where like minded people can learn, share, and interact. Each member pays you a small amount each other and you provide premium content and facilitate learning and growth on a specific topic. The math is pretty powerful… If 500 people each paid you $20/month you would earn $10,000/month. Our friend Erica created YogaTrade.com which connects traveling yoga teachers with job opportunities abroad. We’re big fans of their niche and we love the team over at Yoga Trade. It’s no secret that Yoga Teacher Training is highly lucrative for yoga studios ($2,000 – $5,000 per person). If you have a mountain of experience and a strong marketing channel, this could be a great option. Before considering this option: we recommend either owning a studio or having a large email list + thriving online community. Do you have a fountain of knowledge/experience on a topic that no one else is talking about? Maybe it’s time to share your gift with the world. However, don’t take this endeavor lightly, it’s a ton of work and only a small percentage of books make money. Luckily, self-publishing is becoming very accessible and quite effective! Most people didn’t get into teaching yoga for money. We already got into the sad state of average yoga instructor income above. However that doesn’t mean full-time yoga teachers should be living on the street. Rather, yoga teachers should be able to make a decent living as long as they diversify outside the studio. Is that too much to ask for? Your future will not create itself. 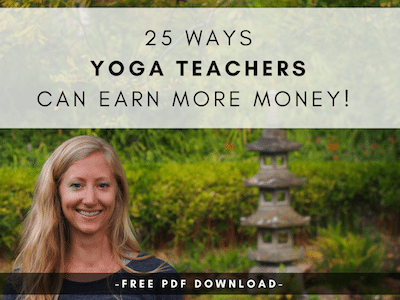 Now that you know how to make money teaching yoga, it’s time to take action. What is one thing you can do today to move closer towards your goals? teachers with the business and marketing skills required to build sustainable yoga careers. PS: If this article resonated with you, please share it on your favorite social channel! Do you use Pinterest? Pin me! I have been following you both for a while now, ever since I found fellow Yoga Nomads (our concept being ‘Flowing Nomads’ based on the Sanskrit PravAha) – you have handed a lot of knowledge to the Yoga world – and I suppose I just wanted to say that it is a grand help to us all. 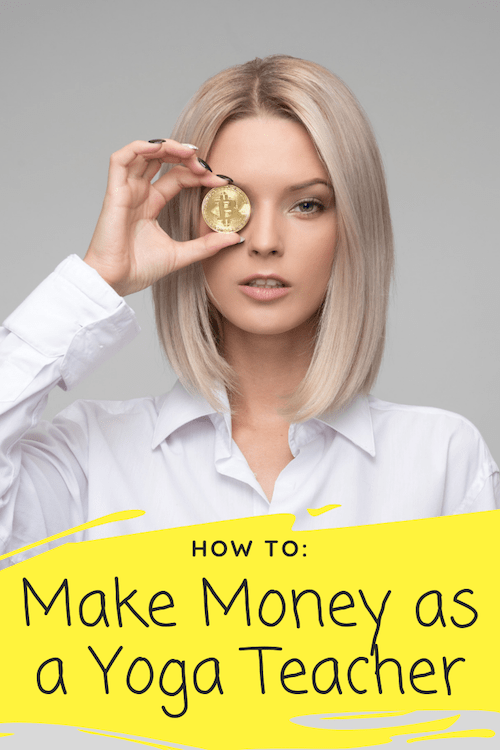 We aware that we are all trying to make money and get by and it is up to us as instructors to spread the the earning wings and fly…and that alone takes heaps of effort – flying and earning money – and with The Yoga Nomads – it has become somewhat easier. A HUGE Namaste to you both – and we hope to meet you both soon.